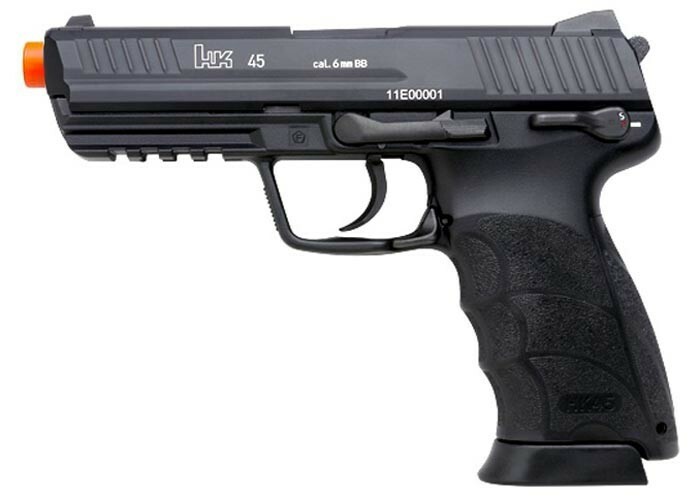 The KWA HK45 gas blowback airsoft pistol is perhaps the most realistic full-scale USP on the airsoft market today. The gun is fully licensed by H&K and has the powerful NS2 gas delivery system for crisp blowback recoil and outstanding shot velocities. The gun also features a threaded outer barrel for attaching mock silencers, a 28-rd magazine, and a shot velocity of 340-350 fps (using .20g BBs). A Picatinny/Weaver rail under the barrel lets you attach accessories with ease, and the adjustable hop-up unit lets you adjust the gun's long distance shooting accuracy. Whether used for skirmishing, collecting or casual plinking, this gun is an outstanding value! 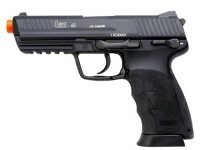 The HK45 now comes with a threaded barrel for attaching fake silencers. What others should know: This thing has been a nightmare since I bought it! First the feeding ramp cracked in half about 40 shots after unboxing...was cheap to fix but still a bummer. The new ramp was to tight on the bbs causing jams which in turn caused the loading nozzle to deform and eventually break...then to top it off, the slide catch rounded off the cheap metal used on the slide causing the slide to no longer lock back correctly when last shot is fired...and no replacement part support or upgrade parts availability... needless to say this is definitely not on par or even close to the reliability and quality I've loved from kwa in the past...I've given up on this as a primary sidearm and went back to my m226 ptp...it now sits as an expensive paperweight on my bench...I totally would not recommend buying this gun if your looking for dependability and quality...research via forums and google shows that these are pretty common issues with this particular gun though kwa claimes they haven't had many complaints or returns...hmmfff. Things I would have changed: Quality overall...not impressed at all.